Summit Canyon has officially reopened. The lower trailhead of the Summit Canyon Trail has been closed for several weeks for erosion repair. Heavy rains last season washed out many of the roads and trails near Donner Creek and the beaver ponds. Heavy equipment was brought in to place new rock and soil in the areas damaged. The work has been completed and the trailhead has officially reopened. Other areas of erosion further up the canyon will be repaired next year. 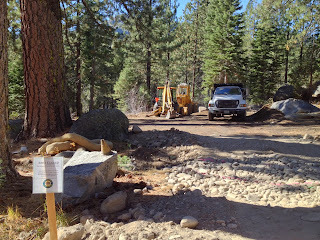 The Summit Canyon trailhead is located on Old State Route 40, west of Donner Lake, 400 feet past the snow closure gate. Parking is on the south side of the road. The trail meanders up the canyon to the top of Donner Summit. The Summit Canyon Trail has a rich history. It follows the path of the Dutch Flat-Donner Lake Wagon Road which was used in the 1860's. The current paved road, SR 40 was built in the 1920's. The Summit Canyon Trail passes through a 260 acre parcel that was purchased in 2011 by the Truckee Donner Land Trust, in partnership with California State Parks.